You have often said that some of the most important lessons and skills we learn in our school are taught right at the beginning. You are perfectly right. While many masters teach their best arts to their selected students after the students have spent many years with them, we teach every student the best arts right at the beginning. I remember clearly what my sifu, Sifu Ho Fatt Nam, told me when he taught me One-finger Shooting Zen. He said, “One-Finger Zen and Tiger-Claw are two of the most advanced arts in Shaolin. They are taught to students right at the start in our school so that they can train everyday and have sufficient time to master them.” One-Finger Zen is used in “dim-mark” and “Tiger-Claw in “chin-na”, and both are found in One-finger Shooting Zen. The very first arts we teach in any chi kung, Shaolin or Taijiquan class, and also we use to start subsequent classes, are entering into a chi kung state of mind, entering Zen or entering Tao. Without entering into a chi kung state of mind or entering Tao, a person cannot perform genuine chi kung or genuine Taijiquan, even when he uses genuine chi kung or Taijiquan techniques. He merely performs gentle physical exercise or Taiji dance. One may be able to perform genuine kungfu without entering Zen, but his performance remains at a physical and low level. Only by entering Zen can he develop internal force and brings his Shaolin performance to a high level. Sometimes these important lessons can be missed by some as they eagerly pursue other “more interesting” aspects of our arts. This, in our opinion, would be a mistake as the beginning teachings are not only really interesting, but also help build a strong foundation, to fully appreciate and develop the skills required for deeper practices and benefits. More likely today is that these important first lessons are not even taught at all. Most chi kung, Shaolin and Taijiquan teachers are unaware of these important lessons. A very small percentage of these teachers, less than 5% of the total number of people who practice chi kung, Shaolin Kungfu and Taijiquan, may eventually become real masters after many years of dedicated training, and have high levels of chi kung, Shaolin and Taijiquan attainments, but they are still unaware that they could reach high levels of attainment because, without their conscious knowing, they had entered a chi kung state of mind, entered Zen or entered Tao during thair training. More likely, some students chase after novelties, like tingling sensations at their finger tips in chi kung, winning trophies in Shaolin competitions, and learning exotic sets in Taijiquan. They have forgotten the aims of practicing their arts, like enjoying good health in chi kung practice, and being able to use their arts for combat in Shaolin Kungfu and Taijiquan. Realizing these aims as well as other wonderful benefits are only possible if they have practiced well the initial lessons. The aims of the 2016 UK Summer camp are to ensure students/teachers not only develop these skills but also realise them as well, for if they don’t they would have missed a wonderful opportunity to experience life as a meaningful flow of energy. It is telling that you make a difference between realizing these skills and developing them. Most practitioners neither realize the great importance of these basic skills nor develop them. Some may realize the importance of these skills, but never develop them. They know, for example, that they have to be relaxed and not thinking of anything in order to generate an energy flow, but they never succeed in generating an energy flow. On the other hand, some may have developed their skills, but they never realize what these skills are. They may have developed internal force through years of dedicated training, for example, but they never realize that they need to be in a Zen or Tao state of mind for the internal force development. Many chi kung and kungfu practitioners have missed the wonderful opportunity to experience life as a meaningful flow of energy. Indeed, many of them may not really understand what the expression means although they know the dictionary meaning of all the words used. Those who realize its meaning and experience life as a meaningful flow of energy will have good health, vitality and longevity besides other benefits. But many who practice chi kung are weak and sick, and many who practiced Shaolin Kungfu and Taijiquan are stressful and injured, though the arts they practice are supposed to enhance their flow of energy. We have already discussed the aims of the 5 day Foundations of Kung Fu course, for which we are very much looking forward to. It is beneficial to elaborate on the benefits of the kungfu course at the coming UK Summer Camp. I have often mentioned an ever-victorious strategy against other kungfu styles or other martial arts, which is to apply a combat sequence relentlessly but taking great care of our own safety, against an opponent in free sparring. Though I used this strategy in my own free sparring in my younger days and remained undefeated, it will be the first time I teach instructors and students in our school to put this philosophy into practice at the kungfu course during the coming UK Summer Camp. Barry suggested that I devised 4 combat sequences, and course participants would choose one. I have done that and shall post the 4 combat sequences on my website later on for participants to choose. If we apply any one of the 4 combat sequences flowingly and forcefully, our opponents would have no chance to fight back. They would be overwhelmed by our flow and force. Even if they could match our flow and force, they have no techniques in their repertoire to defend against our pressing attack. they will be pressed back against a wall. However, if an opponent is very skillful, he may escape our pressing attack, and counter attack with typical techniques from his art. We shall learn to counter these typical techniques and continue to press him back against a wall. While attaining this specific objective of winning free sparring, which will make our kungfu training meaningful, we shall also place much focus on our general aims of attaining good health, vitality, longevity, mental clarity and spiritual joys. To most other martial artists, to attain good health, which includes being free from stress and injuries, is antagonistic to free sparring. Many other martial artists are stressful and injured in free sparring. But we are elite. Not only we will be relaxed, but we learn to be unhurt in free sparring. The course will even attain more than this, Not only we shall be relaxed and unhurt in free sparring, the free sparring will contribute to our good health, vitality, longevity, mental clarity and spiritual joys! It is hard for others to believe, even to comprehend. One has to experience the course to find out. We would also like to explore and share with you our understanding of the foundations of Chi Kung, our ideas for a series of Chi Kung courses and how this fits in with the Kung Fu. any aspect of their daily life, whatever the outside pressures. The foundations can be taken and used at any level. Shaolin Wahnam students can aspire to the highest levels, if they realise thatâ€™s what they can aim for. Your description is excellent. It clearly describes in a systematic manner what we do in our school, which you have nicely summed as circulating energy and building energy. Indeed, these are the two aspects of any genuine chi kung training, described in Chinese as “xing qi” and “yang qi”, which literally means “circulate energy” and “nourish energy”. I am glad that all our instructors and students can circulate and nourish energy in their chi kung and kungfu practice, most can do so in sparring under pressure. Real fighting is, fortunately, rare in our modern societies, but I believe many of our instructors and students can do so. I also believe that they can circulate and nourish energy in their daily life where they are under pressure. In other words, due to their training in our school, they can remain relaxed and be able to think and react accordingly even in difficult situations. 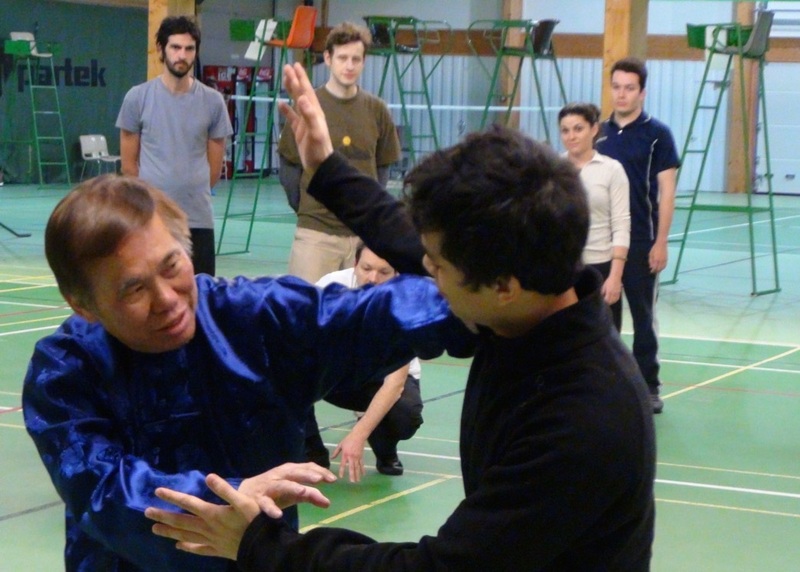 If you like, we may create simulated situations during our chi kung courses at the UK Summer Camp for our students to apply their chi kung training in difficult situations. You may, for example, suddenly rush into the training hall and announce that there is a fire to see how our students react. It is best that such simulated situations are to be created when I am not in the hall. I am nervous and stressful. I find it hard to relax. How do I enter into a chi kung state of mind? Editorial Note: Asked in class by a beginning student in Grandmaster Wong’s basic Five-Animal Play course. Just follow my instructions as best as you comfortably can. In half an hourâ€™s time you will find you are able to relax. By the end of the course today, you will be able to relax easily. This is a practical answer, and the best answer. You can assess whether what I say is true in half an hour, and again by the end of the course. You donâ€™t have to wait for three months to find out. But I shall also give you an academic answer, which some people like to hear but is not as useful as the practical answer. Your problem of not being able to relax is very common. In my early years of teaching, many people who first learned from me told me the same problem. Gradually less and less people told me this problem. Now very few people mention this problem. If you donâ€™t do anything, you will be relaxed physically and mentally. In practical terms, if you do not tense your muscles, you will be able to relax physically. If you do not intellectualise, you will be able to relax mentally. Most people cannot relax because they close their mouth and tense their muscles, usually unknowingly. They have been so conditioned to closing their mouth and tensing their muscles that they do not consciously realise it. They are stressful because myriad thoughts come to their head. Again, they have been so conditioned to having countless thoughts that they are no conscious of it. They also do not know, although it is actually quite simple but may not be easy to those who are habitually tensed and stressful, that if they make an effort not to tense their muscles and not to think of any thoughts, they can relax. Not doing something is simpler than doing something. Not tensing their muscles and not thinking of anything is simpler than tensing their muscles and thinking of something. Can we have a shower before or after our practice? Our art is powerful, so we can enjoy such privileges. Other practitioners may not have such privileges. They have to wait for half an hour before or after a practice session before taking a shower. In the same way, if we made some mistakes during our practice, we donâ€™t have to worry. Our chi flow will erase whatever harm the mistakes might have caused. Other practitioners do not have this privilege. If they made some mistakes, the harm would remain as they did not have any chi flow to flush away the harm. In my book, â€œChi Kung for Health and Vitalityâ€, I mentioned 10 doâ€™s and 10 donâ€™ts. One of the donâ€™ts is not to have a shower immediately before or after we practice. This book as well as the doâ€™s and donâ€™ts mentioned in it, are meant for readers who do not have an opportunity to learn from me personally. Their result learning from a book, even when they have practiced perfectly, is far less than those who learn from me personally. Hence, for them, they have to wait for at least half and hour before and after practice for a shower. Moreover, the book was written about 20 years ago at a time when my teaching was not as high level as it is now. Now students learning personally from me have more powerful result, and enjoy the privilege of having a shower immediately before or after a practice. Why is it important for us to perform the form correctly in a kungfu set? It is important to perform the form of a kungfu set, like San Feng Wudang Set, correctly necause the success of its combat application depends on its correct form. If the form of a kungfu pattern is not correct, not only it looses its combat effectiveness, it may also offer opportunities for opponents to counter-attack. Let us take a simple example. An opponent executes a middle thrust punch, like Black Tiger Steals Heart. An exponent responds with Shift Horse Ask Way from the San Feng Wudang Set. This response is excellent when the form is performed correctly. It minimizes the opponentâ€™s force, and places the exponent in a favourable position to counter-attack without little opening for the opponent. However, if the form is incorrect, not only the same response does not give the exponents these advantages, but also it offers the opponent opportunities to defeat the exponent. If the exponent does not rotate his waist, for example, he will not be able to minimize the opponentâ€™s force. If he does not sink back in his stance, he may too close for the opponentâ€™s attack. If he does not position his legs correctly, he exposes his groin for the opponent to attack. If he leans backward or foreard, his balance is unfavourable for him. The wrong form places the exponent in an awkward position. Even if the opponent may not be successful in his initial attack, the awkward position of the exponent makes it easy for the opponent to continue, and makes it difficult for the exponent to respond. 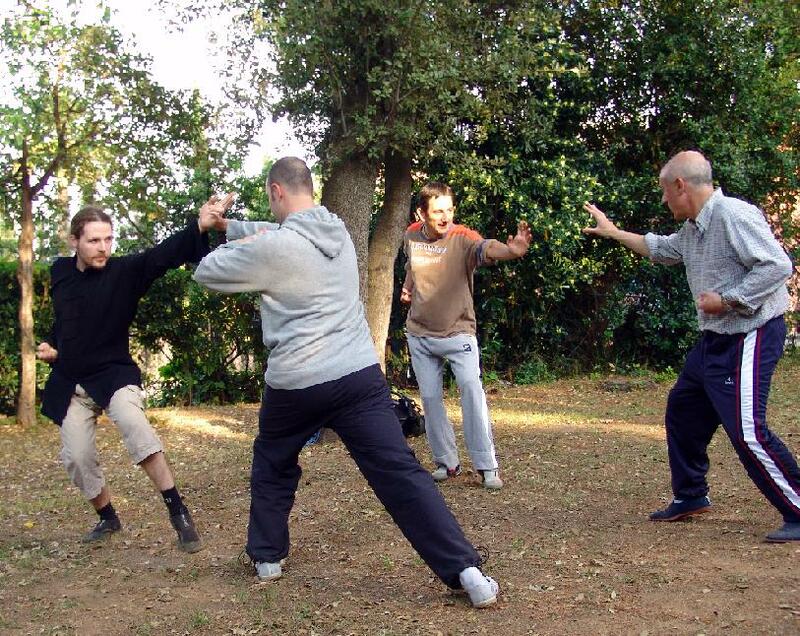 Hence, picture-perfect form is very important in kungfu, even for beginners. If beginners have their form correct right at the start, they donâ€™t have to spend much time and effort relearning it later on. However, you may notice that I am not particular about form for beginners in chi kung. In fact, for beginners if their form is not perfect, though not incorrect, I usually ignore it. 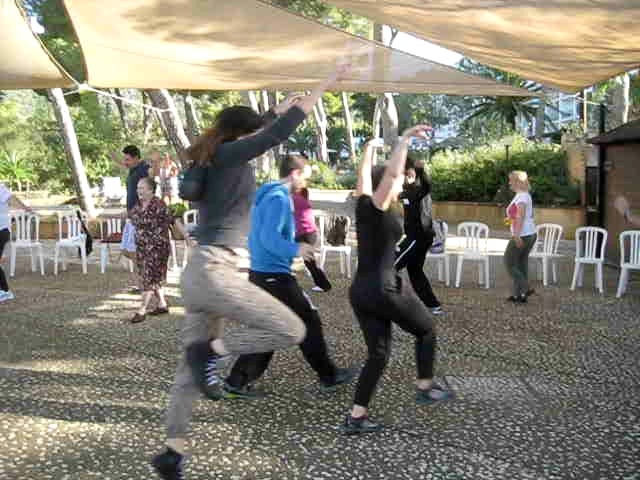 The main reason, for ignoring minor mistakes as well as for not particular on picture-perfect form, is that I want beginning students to get on to energy flow as fast as possible. If I pay too much attention to picture-perfect form, beginning students will be unduly worried about their form, get out from the chi kung state of mind which if often induce, and perform the chi kung technique as gentle physical exercise. Even with imperfect form, so long as the students relax and do not intellectualize, they can generate an energy flow. As students progress, we pay more attention on form. When students have reached an advanced level, they could have picture-perfect form. Hence, I often mention in class when teaching a new technique that beginning students need not worry about details but just get the general picture right, whereas advanced practitioners can focus on finer points, like picture-perfect form. However, we have come full-circle. We have become so cost-effective that sometimes I tell advanced practitioners to purposely get their form wrong, to tense their muscles , or to intellectualize sometimes so that they may not have too powerful result from their practice to prevent over-training! This is a big job to other people. Nevertheless, instructors whether in chi kung or kungfu, whether they teach beginners or advanced students, must have picture-perfect form. It is because they are models for their students to follow when practicing any kungfu or chi kung techniques. This entry was posted in Chi Kung, chi kung state of mind, Grandmaster Wong Kiew Kit, Kung Fu, question-answer, Shaolin, Shaolin Wahnam, UK Summer Camp and tagged chi kung, chi kung state of mind, Grandmaster Wong Kiew Kit, Kung Fu, QUESTIONANSWERS, Shaolin, Shaolin Wahnam, UK Summer Camp on March 7, 2017 by Wei Joo Lee. 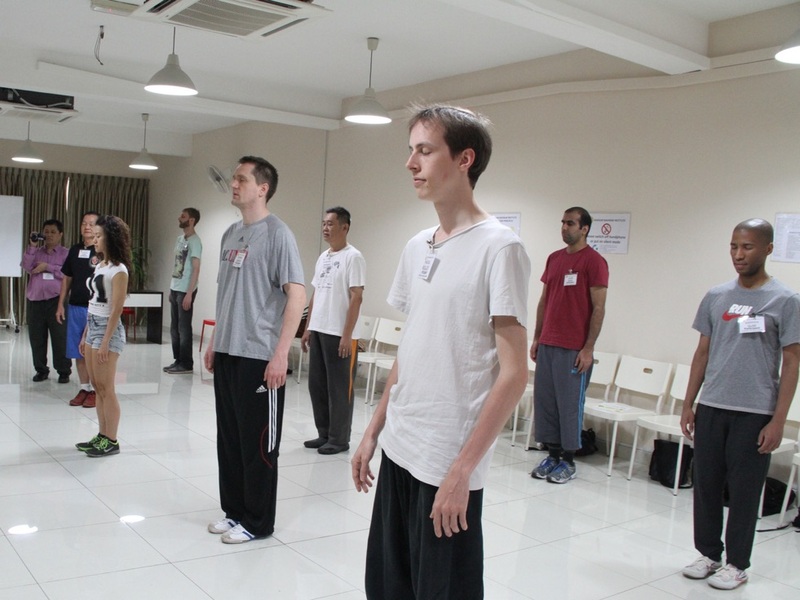 An effective way to develop internal force is zhan zhuang or stance training. Past masters have provided an excellent way for exploding force, namely to start from the back leg, rotate the waist, and complete at the hand. This entry was posted in exploding force, fa jing, Grandmaster Wong Kiew Kit, internal force, Kung Fu, Shaolin, Shaolin Wahnam, stance training, UK Summer Camp, zhan zhuang and tagged black tiger steals heart, exploding force, fa jing, Grandmaster Wong Kiew Kit, internal force, Kung Fu, Shaolin, Shaolin Wahnam, stance training, UK Summer Camp, zhan zhuang on August 18, 2015 by Wei Joo Lee.